We all love fruits. Right! Peeches, Strawberries, Lemons, Oranges…delicious! And how about playing with these fruits…you can play with real ones too but here we are talking about Summertime mobile pokies game which has the theme based on fruits. As the name suggest Summertime, so does its theme of fruits being popular among all during summers. Such kind of fruit based games has been quite known during the early period of gaming too! 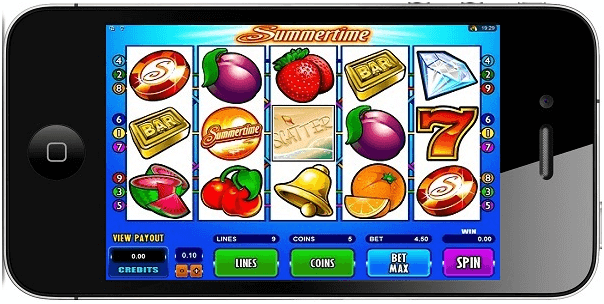 Summertime produced by Microgaming for mobile came out in 2014 and is available on iOS, Android smartphone devices as well as tablets, iPhones, iPads and runs HTML5. The mobile version of the game come with five reels, nine paylines and three rows of symbols. With decent graphics and sound it has traditional symbols such as fruits and bars that appear all of which mix the theme of summer and a classic video pokies. Even if this is a contemporary video pokies with plenty of special perks and benefits, game icons are almost the same as those found in old-style three-reel slot machines and include lucky sevens, bells, Bars, watermelons, oranges, lemons, plums, strawberries and cherries. Two Summertime symbols, a diamond and beach view complete the list. The game icons are used to form winning combinations and award instant credit prizes, whilst there are three ways to improve your line payouts. 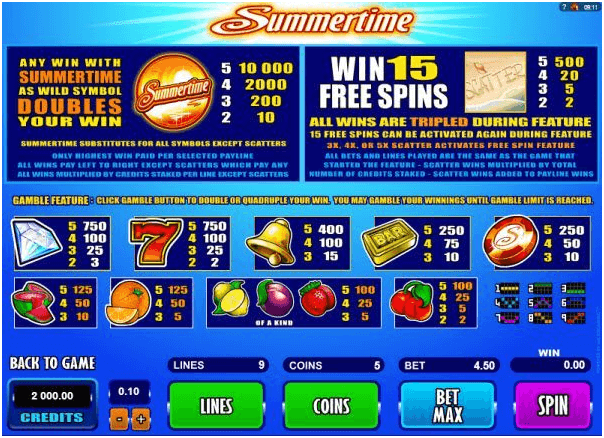 Summertime Wild completing a win will double any payout, Scatter Pays award a prize of up to 500x the total bet, whereas Free Spins round where all prizes are tripled is definitely worth to highlight it. You have to select the pokies from the mobile casino lobby (some of the best mobile casinos are given at the end of this post for you to choose), you will be taken straight to the main screen, You can go to the settings tab by swiping to the right and can choose your coin denomination from nine different values, ranging from $0.01 to $2, as well as wager between 1 and 5 coins per line. Activate the Quick Spin option if you want your bets to be settled quickly and also can disable game sounds if you do not like. Then you swipe to the left to return and repeat the process to visit the paytable. You will find all payouts and special features explained here, together with the payline structure and additional information. Wild symbol is depicted as Summertime Logo and it will substitute for all other game icons with the exception of Scatter to complete wins. One or more Wilds appearing in a winning combination doubles the payout. Meanwhile, Beach View is Scatter, and while its main purpose is to trigger the Free Spins round, it also awards Scatter Pays for two or more icons occurring anywhere. Three or more Scatter symbols appearing in any position trigger the Free Spins round, where you are awarded 15 free games regardless of the number of icons that triggered the feature. All Free Spins wins are multiplied by x3, whilst Scatter Pays will ensure players receive an instant credit prize of 2x, 5x, 20x and 500x total bet for two, three, four and five Scatters respectively. You may not find any progressive jackpots linked to the Summertime pokies, but base line payouts are nothing short of impressive when taken into account that you will be wagering between 9 and 45 coins per single spin. Obtain five Summertime Wild icons on any active payline while betting 5 coins per line and you will be awarded whopping 50,000 credits. You can have the app for Summertime from App store like Appszoom where it is available free to install instantly and enjoy the gaming experience.